For a long time Samsung comes out as a trendsetter in the fashion segment, at least in among the clamshells. 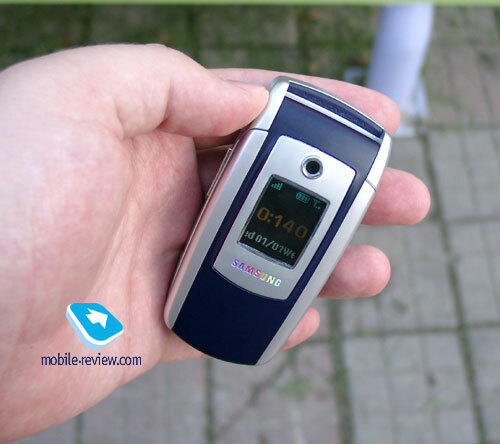 New E700 – a fashion phone of the new generation, was made to consolidate this position. The main differences are not only in design but related to handset’s functionality. Firstly, it doesn’t have external aerial. It is the first clamshell phone of this class. 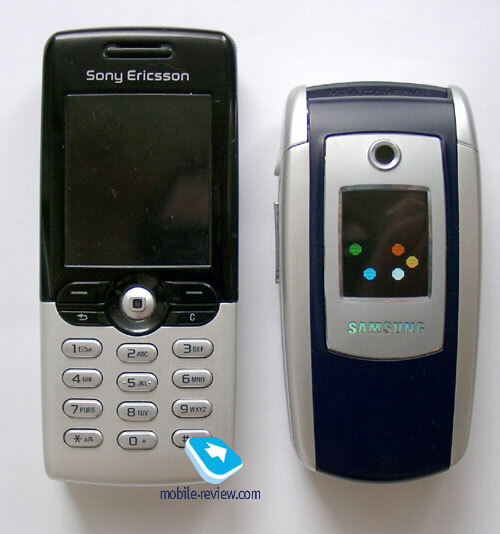 Well, we could mention Sony Ericsson Z600, which would be available at the same time on the market, but it is not officially unveiled yet and lost a little bit to E700 in response to dimensions. The device from Samsung has small size (90 x 45 x 23 mm) and weights 86 g. It is not very light; the phone also isn’t hidden in the hand, evening the man’s one. It seems to us that the handset is very comfortable and fits snugly in the palm. It is easy to open it with one hand and that it is a large advantage of the clamshell handset. 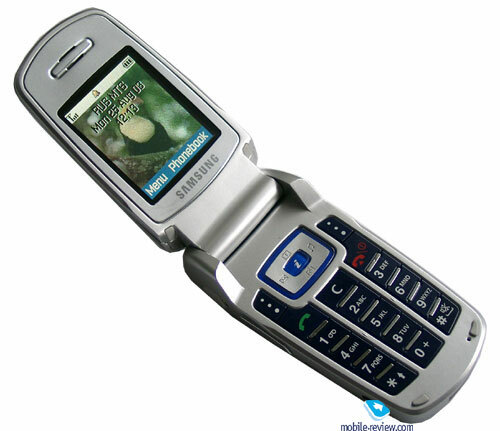 Both ladies and gentlemen are related to a target group of this phone. According to out estimations the correlation between them will be 40:60. This rate indicates to the universality of this product. The main age group will be people of 22 - 35 years old. It would cover different levels of population, like gilded youth, high-paid employees. So, it also show the universality of the product and it is its second advantage. 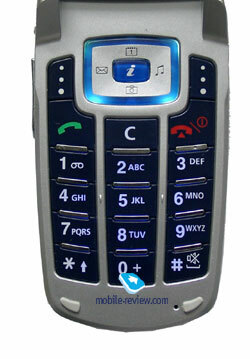 The phone is made in silver color; dark-blue front cover is built-in it. Dark-silver rim can be found around the external display. It is made with a help of metal sputtering. You can check it if touch it. 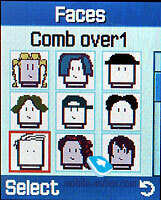 A small window of the integrated camera is placed above the screen. 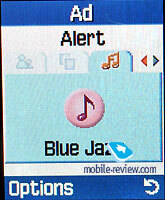 Two colors are used on the back cover of the phone; blue color is dominated, battery cover is blue. On the whole these two colors are harmonized with each other, the phone seems to be rather expensive. One can see such words as VGA CAMERA on the top, they are written on the rubber cap. Its aim is to protect upper part while opening from scratches. 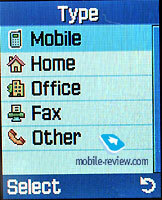 A double volume key is placed on the left-hand side of the handset. It can be used to activate the external display. It is also possible to define your actions while incoming call (reject call, setup silent mode). Handsfree connector is located on the top of the left part of the phone, it is covered by a rubber cap, which is fastened to the phone. Lower one can see IrDA. 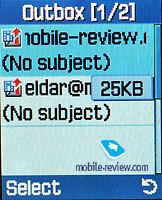 Now it is possible not only to transfer data, but business cards as well, E700 has a full vCard. 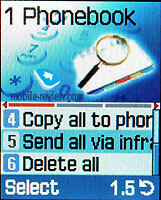 Now you can not only receive cards from the other phone, but also send any record from the phonebook. A key to control camera is placed on the right side of the handset. You can use it to activate camera (self-shooting mode) when the phone is closed. Then, you can see a picture on the external display; it is not so wonderful as on the internal display, but it is possible to recognize the object. 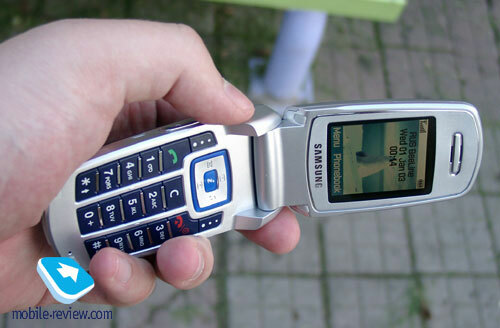 It is the first GSM-phone, which could display picture on the external screen. 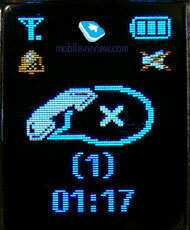 E700 is equipped with OLED –screen, which supports up to 256 colors. The resolution is of 64х96 pixels. 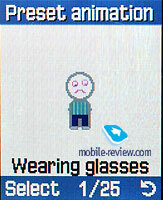 To the contrast of other Samsung’s models, for example E400, this display has a vertical orientation. Several color balls are appeared in different places on the screen in the standby mode with a period 2-3 seconds. It is one of the screen savers. 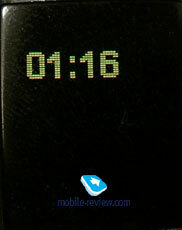 The second screen saver is more typical – usual digital clock. Such actions as receiving of new messages, calls, alarm-clock and etc. 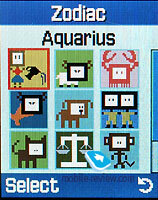 are displayed as beautiful icons on the external screen. 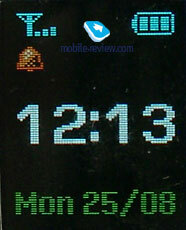 The information on the screen is not seen in sunny day outside, it is a typical shortcoming of this kind of displays. Strap hole is situated on the top side of the phone. System connector can be found on the bottom. It can be covered with a rubber cap, which is connected to the phone. 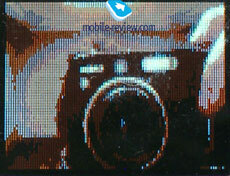 When you open the handset, you can see a large internal display which has a resolution of 128x160 pixels (28x36 mm). 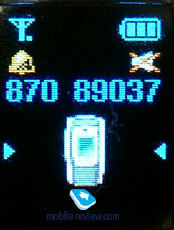 Up to 5 text lines (16 characters each), 2 service lines and tips to the soft keys use are contained on the display. The font size is large and text can be easily read. 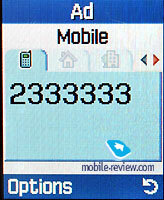 When you input a phone number, font size becomes enormous; the letter can be noticed at a long distance. 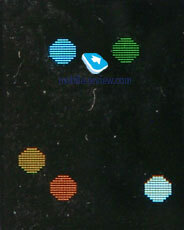 TFT-screen displays vivid and bright colors. Nevertheless, the picture is not so alive under the Sun, but it is possible to read the information on it if you select right angel. The keypad is made of plastic. 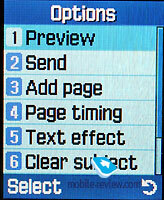 There is a 4-directional navigation key with fast access key to wap-browser in it. Navigation key has an edging made of transparent plastic, it becomes blue when the backlighting is active. Other keys are dark-blue like the color of the phone’s exterior. Alphanumerical keys are divided by silver insertions that causes an interesting visual effect. The keypad is not very comfortable but there are no problems with it. All characters are clearly visible in different lighting conditions. Lithium-ion battery of 800 mAh capacity is applied in the phone. According to the manufacturer, it could operate about 240 hours in the standby mode and up to 3 hours in the talk mode. In reality (MTS network) the phone worked about 3 days in case of 45-50 minutes of talking and up o 25 minutes of using other applications. Taking into account quality of both displays, we can see that the developers of this handset reached the longest possible battery life. If you do not use the phone so actively, operating time isn’t considerably increased, only to 4 days. Time of full re-charging is about 2 hours. Battery status indicator doesn’t always display remained working time. For example, if you leave the phone for 2 days and won’t touch it, the indictor will show that it the battery is full (3 points). If you try to make a call then, you will see only one point after it. Remember this peculiarity if you have pauses when use the phone. 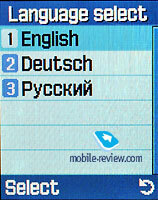 The main menu of this phone looks in the following way: menu title, animated picture and first three items of this menu under them. Each item ahs its own number, fast shortcut number navigation is available. Unfortunately, the navigation can be used only in the selected item of the main menu. It is a payment for such menu organization. 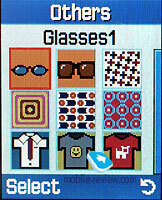 Horizontal scrolling allows to list bookmarks and view the phone numbers. 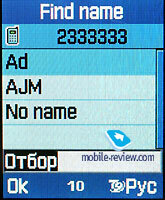 Both phone numbers from SIM-card and phone memory are displayed din the total list. There is a search by name, you need just to enter first letters of the name to change the list. Some notes can be sent via IrDA, it is also possible to receive other records from the other models or PdAs. Such menu item as “send all records” is very comfortable. You can easily copy the information to other devices. We try to use this function with different PDAs and phones. There were no any problems with it. Messages. 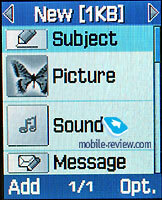 There are two separate items, which allows operating with SMS and MMS messages relatively. 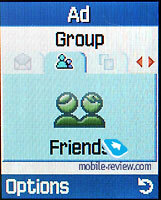 Up to 200 SMS-messages can be stored in the phone. 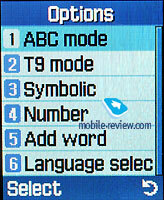 There are up to 9 editable SMS-templates. 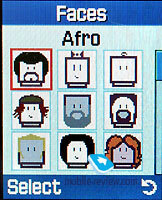 The phone support EMS, so it is possible to add pictures, animation and melodies. Set of standard files is usual, there are no changes compared to other models. 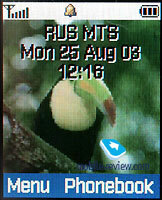 Now it is more comfortable to work with MMS-messages. When you create a message, a template with fields to input text, music, picture, theme is appeared. 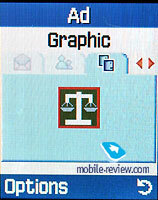 You can create several pages, set showing time between them, adjust font (size, style). You can attach your own photos to these messages. 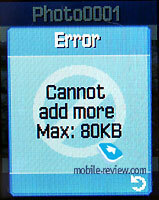 The maximum size of one MMS-message couldn’t exceed 80 Kb. There is a special folder for drafts and own messages. 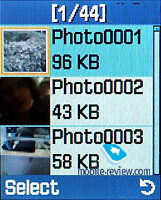 Memory store photos and MMS-messages is shared dynamically. Total memory pool is about 9 Mb. It’s more than sufficient for the phone of this class.